Let’s just assume that if you’re reading this blog, then you have already graduated past the notion that all cooking where men are concerned, happens outdoors over open flame. If, however, your average conversation about food still involves Tim Taylor grunts and/or taco bell references, then let me just save you the time and tell you to try a different blog. That being said, there are few tools in a man’s kitchen arsenal of more value than a well-seasoned cast iron skillet. Note that I said, “well-seasoned”. This is key. A well seasoned skillet will produce better tasting food and be more ‘non-stick’ than the fanciest cookware on the market today. A poorly seasoned skillet will, however, turn everything you cook into the new bottom layer of your pan. Seasoning is a simple and practical step and like all maintenance, can either be viewed as a chore or as a discipline unto oneself. I choose the latter…. The first step is to clean your skillet thoroughly. This can be done a couple of ways. Option one is the method used in many commercial kitchens to clean their griddle. Clear the skillet of any leftover debris, then get it hot and add about a quarter cup of vodka. This will produce a very dynamic effect as the alcohol will be consumed very quickly and make quite an impressive amount of steam. Rinse and wipe down. This consumes leftover oil and food and prepares the skillet for seasoning. When your skillet is coated with harder to remove food residue or you don’t have any vodka on hand, then you may want to go with option two. Option two is simply to scrub your pan with a copper scouring pad under hot water. What is important here is that you don’t use soap. It won’t be the end of your pan if a few bubbles get in the water, but you don’t want to use large amounts of any kind of cleanser. 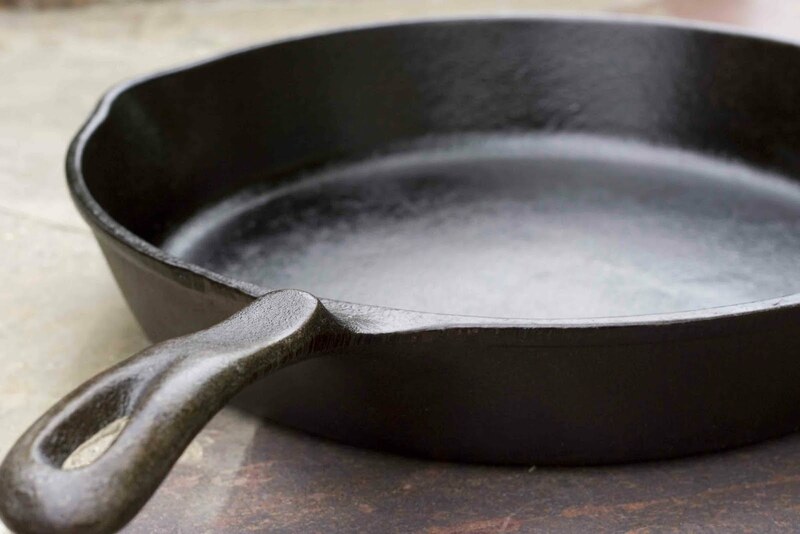 A good cast iron pan will become more seasoned with time and use but harsh cleaning agents will undo all of that hard work. So just put a little elbow into it and you’ll be fine. Once you have a clean surface you will want to dry it thoroughly. It should look smooth with a dull finish. Although there are some very elaborate methods for seasoning out there, I have found that this simple approach always produces a great season. Put your pan on a burner and turn the head to medium-high. Just at the point that the inside of the pan starts to smoke, pull it off of the burner, move it to the side and pour a couple ounces of oil into the pan. Then, take a folded paper towel (or two, the pan will be very hot) and spread the oil over the entire inside surface of the pan, sides and all. Keep working the oil into the pan until the coat is shiny, even and smooth. You should not have any excess oil left in the pan so if you do, change paper towels and sop up the left over. After you are finished, leave the pan out on the stove top or on a wooden cutting board to allow it to fully cool. The next time you pull it out to cook, you will be pleased to find just how easy it is to use your pan for cooking just about anything. A note on cooking: The value of cast iron is it’s heat retention. This is not some paper thin aluminum number that changes gears like a Ferrari. It heats up slowly and stays hot long. I like to preheat my pan on low for the last few minutes of my food prep just to get the whole pan evenly heated before bringing the temp up to whatever I’m cooking at, and you never want to get it too hot or else your cooking plans will have to stall out while you wait for your pan to come back to a usable temp. In the end, there are a couple of extra steps required when using cast iron instead of non-stick aluminum, but the rewards are great for those willing to take them.